The secret is in the sauce, it's just a shame it's the trickiest bit to execute. Like many cooks, we were frustrated by the lack of all-natural gravies and sauces on the market. Most commercial sauces come in odd powdered formats, or packets full of salt, MSG, artificial flavours and yeast extracts. Hardly what you'd call real food, and certainly not anything you'd want to pour over a beautiful Sunday roast. So, we made our own! The old fashioned way; by simmering down high quality ingredients and reducing the liquid. No preservatives. No additives. No gluten. Simply heat and pour generously over roast meats. Less time in the kitchen, more time at the table. Bon appetit! The perfect accompaniment for roasts, this delicious old-fashioned gravy is made with our free-range chicken stock. We simmer the stock with vegetables and herbs, then reduce and thicken the liquid. The result is a gravy with a remarkable depth of flavour. Simply heat and pour generously over roast chicken, turkey or other meats. We slowly reduce our Grass Fed Beef Stock with red wine, a dash of port and thyme. The result is a Red Wine Jus with a remarkable depth and concentration of flavour. 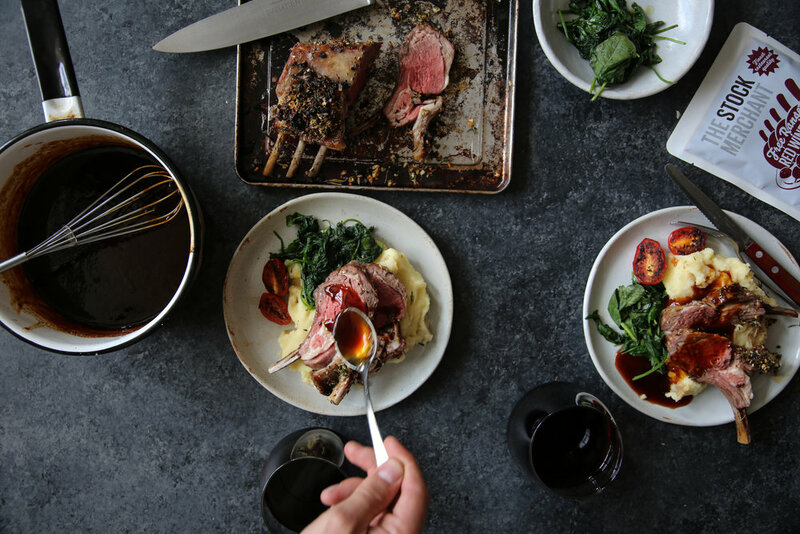 Simply heat and pour around steak, roasts, lamb rack or any other red meat dish. Made with our Grass Fed Beef Stock and Free Range Chicken Broth.